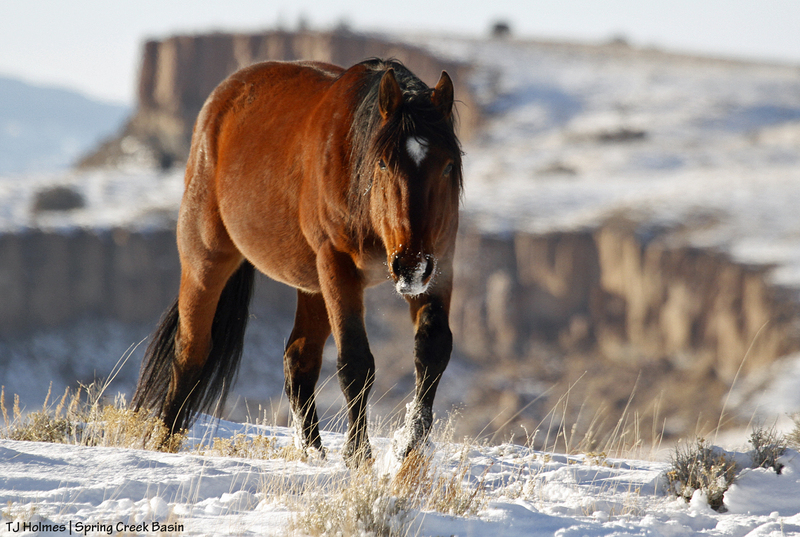 Looking back on 2015, we had many successes offset by many seeming failures for wild horses and burros in America. 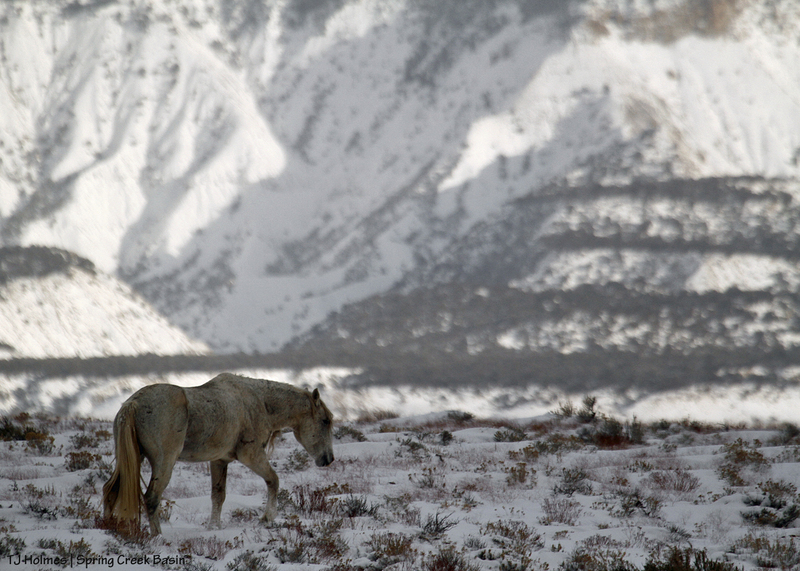 But if those failures gave us lessons with which to succeed in 2016 and beyond, we owe it to our mustangs and burros to pony up and succeed. It’s possible. Our Spring Creek Basin mustangs are beautiful, living proof that perseverance and commitment *can* bring about our desired goals. So, looking back on 2015, we focus on those successes with gratitude and with commitment to carry forward lessons learned. Bite once, make your point, graze peacefully. Be wary of danger, but don’t panic. What lessons have you learned from YOUR horses? Please share! 🙂 And enjoy the last moments of 2015! Coyotes were singing back and forth as the snow rolled in again. 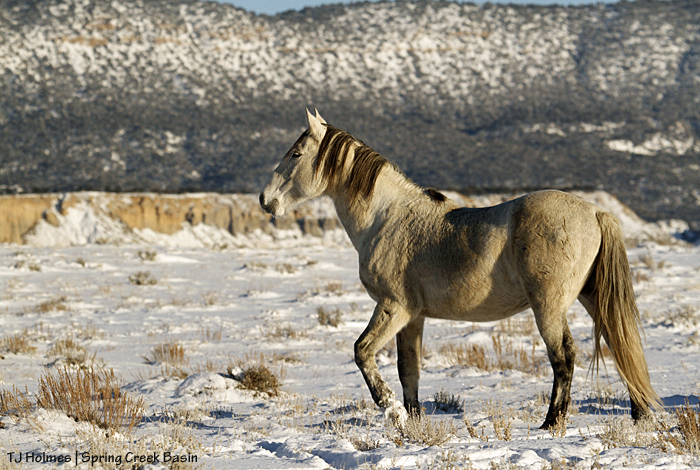 While the mustangs seem to ignore the canines most of the time, this particular time, they seemed very aware of the caroling and who was doing it. Pretty Gaia in her warm copper coat. 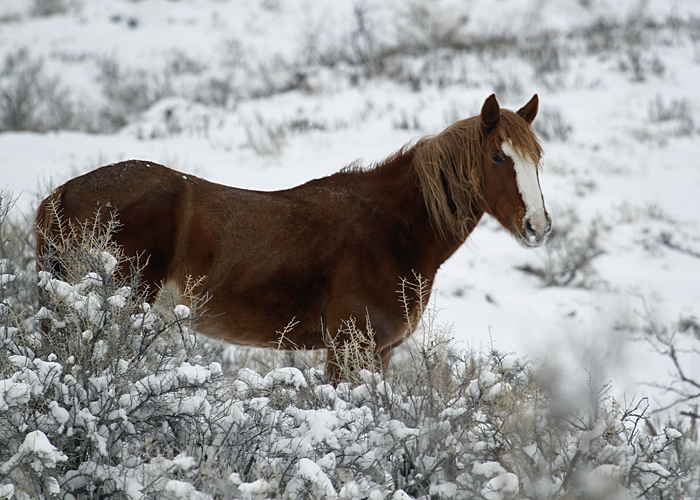 The stark white snow seems to make their colors so much warmer and richer this time of year. Is all that snow for us!? 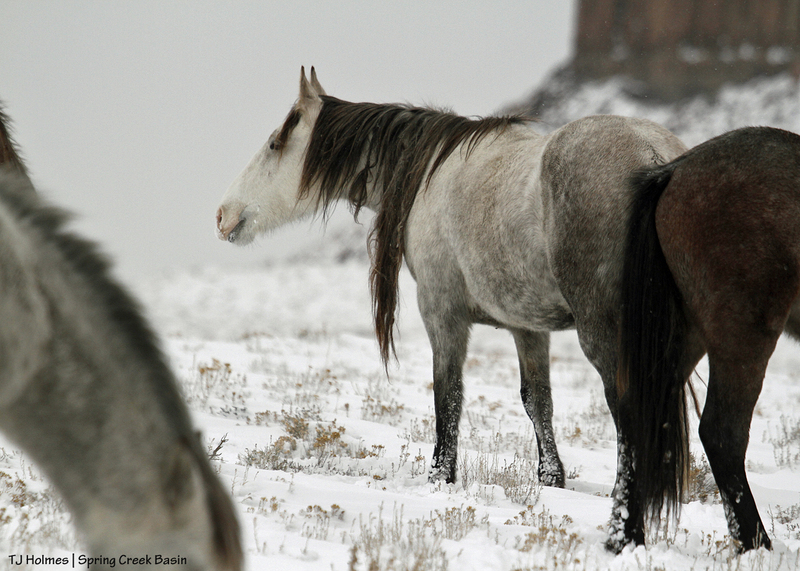 Christmas Day’s weather window didn’t last long for a visit with the merry mustangs. Another blizzard rolled in and pelted us with snow. 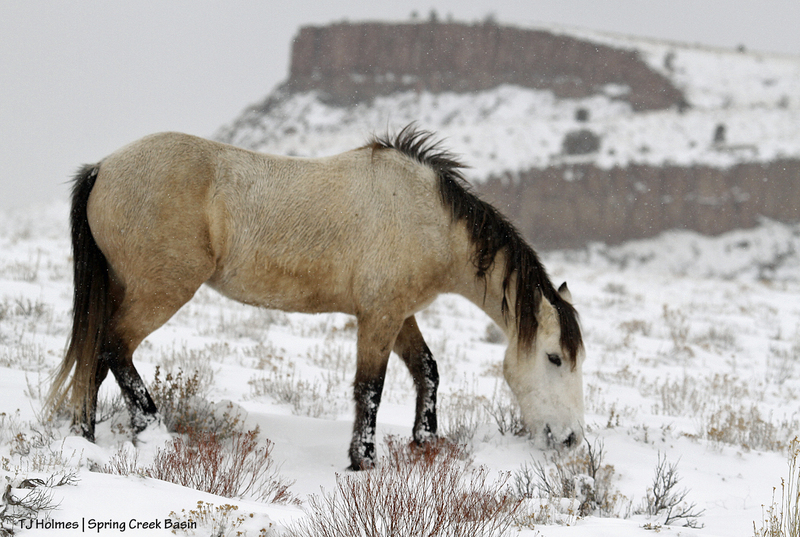 You’re happy trudging through 6 inches of snow while getting slammed with snow when you know all that moisture is feeding the roots of all that hardy vegetation upon which your mustangs depend. 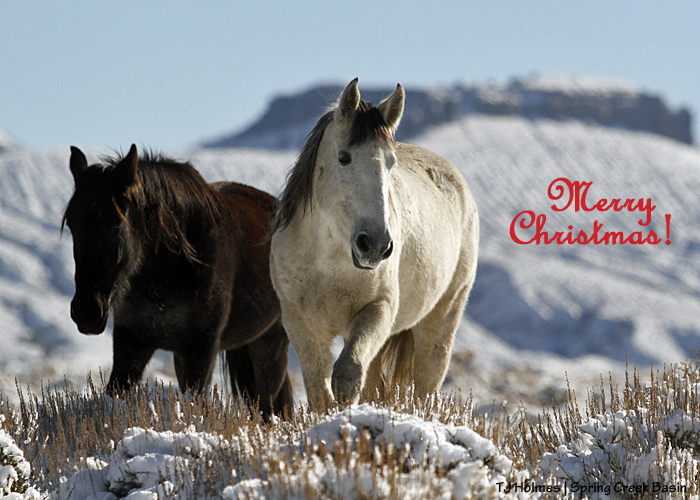 And I’m especially happy when I’ve just had a wonderful Christmas greeting with marvelous mustangs! Enjoy peace; create it where you can. Spread love; it is the best healer. Be good to each other; kindness is the greatest gift. Merry Christmas with love to all!